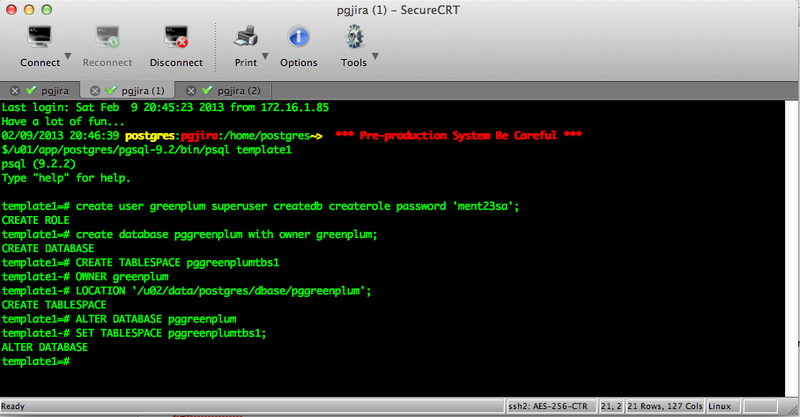 Custom Install Implementation PostgreSQL for Greenplum from Source Code | URimagination, Inc.
As many of you might already know that PostgreSQL is an open source powerful database and more and more it’s becoming popular not only on the developer’s personal project but also in the enterprise arena and hence there are lot best business practices a long with best security implementation guide lines that DBAs, Architects, and Developers need to keep in mind just like you would do and follow in a serious large scale Oracle project. So there is not anymore room to install all under the defaults. For instance, once the best success on many aspects such performance and security for product such Oracle have been that we can customize and manually set storage at the table and tablespaces. Also you never want to user root to install or be the software and nor the installation owner for any application much less for such a critical product/applications such as the database software and objects. So these same principles and best business practices can be apply to projects using PostgreSQL, my personal opinion, I don’t see why not. PostgreSQL, contrib and HTML documentation successfully made. Ready to install. 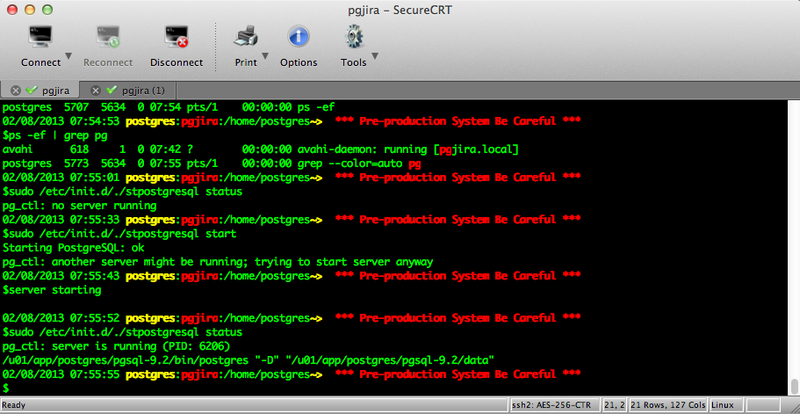 PostgreSQL, contrib, and documentation installation complete. 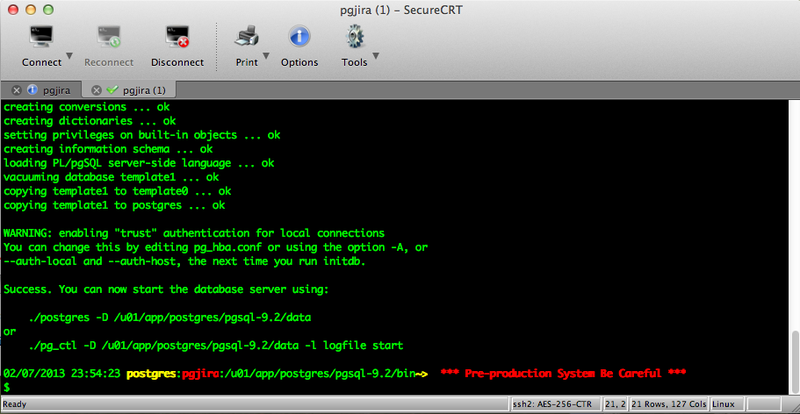 # Only start if we can find postgres and pg_ctl. su - $PG_UNIX_USER -c "$INITDB --pgdata='$PG_DATA_DIR' --encoding=$DB_ENCODING --locale=$DB_LOCALE"
su - $PG_UNIX_USER -c "$PG_CTL start -D '$PG_DATA_DIR' -l $PG_SERVER_LOG &"
su - $PG_UNIX_USER -c "$PG_CTL stop -D '$PG_DATA_DIR' -s -m fast"
su - $PG_UNIX_USER -c "$PG_CTL stop -D '$PG_DATA_DIR' -s -m fast -w"
su - $PG_UNIX_USER -c "$PG_CTL reload -D '$PG_DATA_DIR' -s"
su - $PG_UNIX_USER -c "$PG_CTL status -D '$PG_DATA_DIR'"
echo "# add the output of this script to /etc/sysctl.conf,"
echo "# and then, as root, run"
echo "# sysctl -p /etc/sysctl.conf"
echo "# to load change the kernel settings for these parameters." echo "# page size is: $PAGE_SIZE"
echo "# number of physical pages on this box: $NUM_PHYS_PAGES"
echo "# kernel.shmall should be half of the number of pages. Current kernel.shmall, in pages, is: $CURR_SHMALL"
echo "# kernel.shmall should be:"
echo "# kernel.shmmax should be half of available RAM, in kB. Current kernel.shmmax, in kB, is: $CURR_SHMMAX"
echo "# kernel.shmmax should be:"
echo "# kernel.shmmni is usually set to a sane amount on Linux. Currently, it is: $CURR_SHMMNI"
echo "# kernel.sem usually has sane defauls. They are currently: $CURR_SEM"
# to load change the kernel settings for these parameters. # shared_buffers should be 25% of RAM, but no higher than 8GB. # wal_buffers should be 3% of shared_buffers up to a maximum of 16MB, the size of a single WAL segment. # and 3/4 of memory is a more aggressive but still reasonable amount." CREATE TABLESPACE # this the output after above statement has completed the execution. 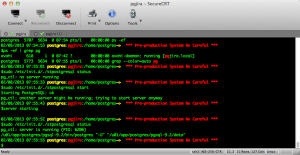 So all is done with our Greenplum database data warehouse project, well at least with the core database at this point. Working with GreenPlum a product Data Warehouse machine from EMC for Big Data project it’s out the scope of this article. So now we all we have is just the empty structure of our databases ready to receive data including Big Data for our Greenplum database, now these are just few GBs but soon these we’l be in the Terabytes.